Princeton NJ -- On a chilly day last February, every member of the senior class checking their e-mail found a note from Associate Dean of the College Richard Williams. Its subject line was typically upbeat and irreverent. "An exhortation to greatness!" it read. All year long seniors get e-mails from Williams, who, as the adviser to the members of the class, constantly invents new ways to provide boundless encouragement to students as they near the finish line of their undergraduate careers. Associate Dean of the College Richard Williams and senior Louise Lamphere have a chat over Krispy Kremes. 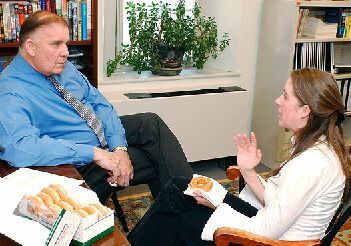 The doughnuts are one tactic that Williams uses to make his office more welcoming to students. Lamphere said she finds Williams, who has been advising members of the senior class for the last 30 years, "extremely approachable, uplifting and understanding." His "exhortation to greatness" e-mail began by rattling off a list of concerns that were likely to be on seniors' minds, from finishing their thesis to finding a job after graduation. "All of that having been said," it concluded, "You ARE going to get it all done. And you WILL be standing there proudly on June 1. I'll see you there!!!!" "We seniors are constantly entertained by Dean Williams' humorous e-mails that keep us on track for graduation day," said Dana Hollenbeck. Williams, a towering figure who exudes warmth and fun, has been advising the members of the senior class for the last 30 years. He provides equal doses of academic advice and moral support, and students are eternally grateful for both. "Dean Williams is extremely approachable, uplifting and understanding," said senior Louise Lamphere. "First and foremost, his e-mails are filled with not only good advice but good laughs. Come crunch time for the thesis due date, I know that I always have someone that I can run to for a laugh or to ask for a much-needed extension. His understanding knows no bounds, for even the almighty and responsible senior can lose her way." Williams is the person seniors talk to when they need extensions on assignments or advice on a wide range of academic and personal issues. He also meets with students in all four classes who are considering a leave from the University for medical or academic reasons. To keep the students on track and upbeat, Williams employs a variety of strategies that make liberal use of clip art, Krispy Kreme doughnuts and birthday salutations. Some students may feel intimidated by the prospect of going to see Williams because he deals with academic problems. "The students don't know what to expect of someone in this job," Williams explained. What they encounter when they arrive at his office is a former Army major who arrived at Princeton in 1970 as a graduate student in the history department. He became an ROTC instructor two and a half years later, and then Neil Rudenstine, who was dean of the college, asked him if he would be interested in applying for the position of assistant dean. "I went from being an Army major on a Friday to assistant dean of the college on a Monday," said Williams, who served a tour of duty in Vietnam with the 173rd Airborne Brigade. "When the phone rang for the first time that Monday morning, I sat and stared at it, because I knew I didn't know the answer to whatever they were asking." Williams got to know the answers to most of the questions, of course, and the phone became crucial to his work. When e-mail came along, he initially resisted it, but he now acknowledges that it is a much better tool for chasing down students who spend little time near a phone. He started sending out amusing, lighthearted e-mails, thinking it was a good way to get the students' attention and make himself more approachable. "They're deluged with information," Williams said. "What I've found is if I can establish a reputation of sending out interesting e-mails that get across a little bit of my personality and address important things without bludgeoning people over the head, I get a better response rate. If students can see I have an active interest in their lives and am not such a horrible character, then they might be more comfortable coming to me for help." Williams' discovery of clip art a few years ago gave him access to thousands of goofy, scary and delightful images to append to his messages. An e-mail he sent out cautioning students to check their academic records to make sure they were going to receive their diplomas was decorated with an amusingly menacing cartoon character waving his fist in the air. Another message urging seniors to find a thesis adviser carried a drawing of Uncle Sam pointing sternly at the reader. "To be able to surprise them pleasantly is a fun thing to do," Williams said. "Somebody will write back and say, 'I was sitting here all stressed out in the library and I read your e-mail and laughed out loud.' It's good to laugh out loud sometimes." Williams also has resorted to using Krispy Kreme doughnuts to convey his sense of fun. He ran a contest for seniors this past fall that asked them to predict the score of the first home football game, with a dozen Krispy Kremes going to the winner. (In addition to his responsibilities with the senior class, Williams determines the eligibility of 1,600 Princeton students to play intercollegiate sports.) The doughnuts have become one of his signature items. "As Dean's Date is approaching, he'll send an e-mail that says, 'Do you need an extension? Why don't you come and have a doughnut and talk about it?'" said Amy DiMeglio, who has worked with Williams as an administrative assistant for the last five years. "It definitely helps the students feel less threatened about coming to the office. It has increased the number of students we see around that time, and they're smiling as opposed to flipping out. He does brighten their spirits." And Williams applies his personal touch to the 1,100 seniors he advises by sending birthday greetings via e-mail to every senior with a birthday during the school year. On his desk is a binder with a list of the birthdates of every senior. He consults the list daily, then sends out cheerful notes with funny artwork. "He truly cares about every single student that comes into contact with him," said senior Summer Crabtree. He is known among his colleagues for logging long hours in his office on nights and weekends. "Dean Williams spends those countless hours on campus for the very old-fashioned reason that he can't bring himself to leave his post until he knows in his bones that his students are fully cared for," said Keith Light, associate dean in the admission office. "Every school community ought to be so lucky as to have such a smart, knowing, experienced dean to help students negotiate their own way." Williams also is responsible for dispensing funds to seniors for research for their theses. Each year he awards funds to about 200 students, who must file an application with a proposed budget and an endorsement from their thesis adviser. A typical grant is between $400 and $500, but some are much larger, enabling students to travel all over the world, either over the summer or during a break in the school year, to complete their research. When Lamphere, a French major, went to see Williams to ask him about getting funding to do fieldwork for her thesis comparing preschools in Senegal and France, she was nervous. But Williams immediately put her at ease, she said, listened to her proposal and assured her they would find a way to work it out. A few weeks later Lamphere received a grant from the George Shultz '42 Fund for $6,500, covering all of her proposed budget needs. "I'm forever indebted to Dean Williams for believing in me and my project, for it has given me the opportunity to not only do research in what I love but also the experience of a lifetime," she said. Many students feel a similar sense of appreciation for Williams: He was made an honorary member of the classes of 1978, 1983 and 2002. And he is grateful that he has a job where he can spend so much time interacting with them. "I kid a lot about being the poster child for career immobility, but I've stayed here so long because I really love working with the students," Williams said. "Every day I get the chance to meet some really fantastic kids." Subscriptions. The Bulletin is distributed free to faculty, staff and students. Others may subscribe to the Bulletin for $14 for the spring semester of the academic year (half price for current Princeton parents and people over 65). Send a check to Office of Communications, Princeton University, 22 Chambers St., Suite 201, Princeton, NJ 08542. Deadline. In general, the copy deadline for each issue is the Friday 10 days in advance of the Monday cover date. The deadline for the Bulletin that covers April 12-18 is Friday, April 2. A complete publication schedule is available at deadlines or by calling (609) 258-3601.